I recently came from a research study in Carcar City, Cebu. We stayed eight days in the said city. I enjoyed my stay and I enjoyed eating a lot. I enjoyed eating pork there. To me, Carcar is the pork capital. It is also a chicharon capital of Cebu and of the Philippines as well. Carcar is home to a wide array of food products. First, lechon. The local hog raising industry supplies the demand for lechon. Lechon or roasted pig is from a one and a half months old pig. We have talked with Kuya Jessie, whose house is located in General Luna St.. His family has been into lechon business for more than 30 years already. 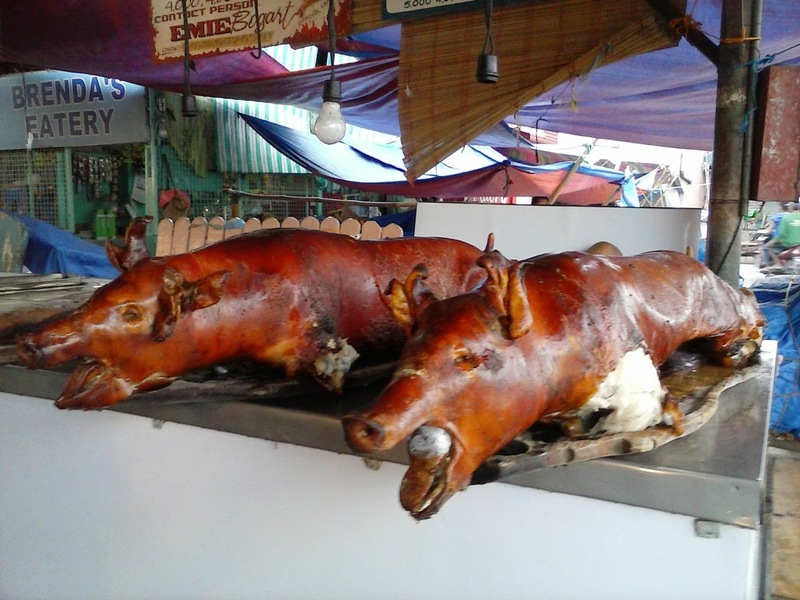 They have stalls for lechon in Carcar City Public Market. Puso, rice in heart-shaped leaves of coconut. Puso. 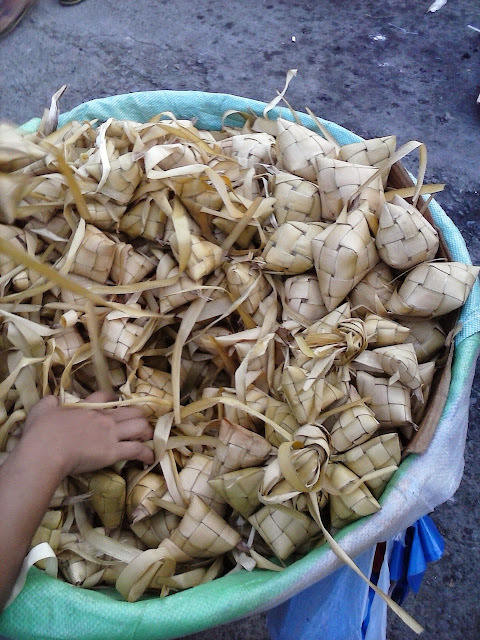 It is rice cooked inside coconut leaves. Shaped like a heart (puso), it is a very delightful presentation for a cooked rice aside from plain rice in a cooker. A small puso costs only about five pesos. Ampao. Imagine eating halo halo without ampao? 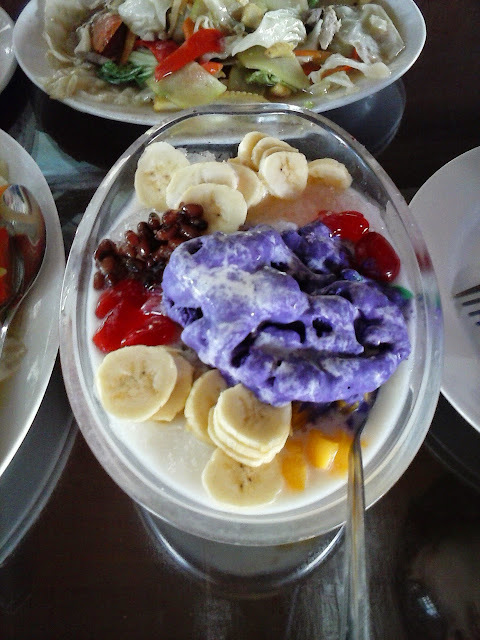 There is missing ingredient for halo halo if there is no ampao. Ampao is popped rice, famous in Carcar, as well. You can buy these in small pieces as low as 20 pesos. Chicharon. 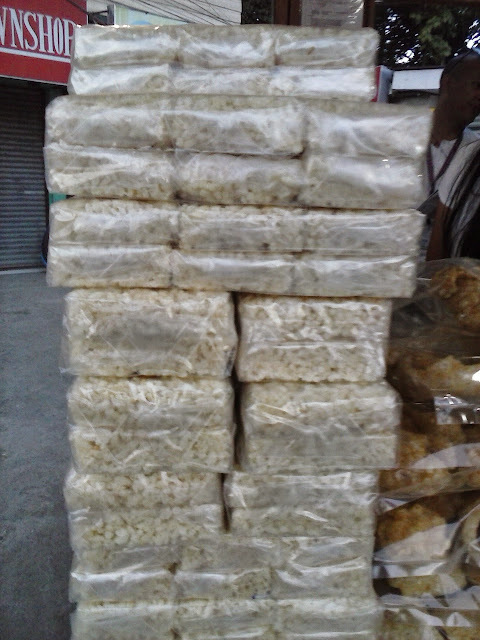 Most famous of them all, Carcar is the chicharon capital. Chicharon is pork crackling. It can be sold from factory price as low as 20 pesos per pack and for retailers as low as 30 to 35 pesos per pack. Made from kubal or pork skin, the numerous chicharon makers in Carcar have different secrets for making chicharon tastier from another. Mat Mat is one of the oldest chicharon makers. Stalls for chicharon and all other food products are located within the Rotonda. In that area, there are about a hundred street vendors aside from the stores. The street vendors, mostly women, can be found from bus terminals to the whole stretch of the Rotonda and the downtown. We have visited a chicharon factory in Barangay Bolinawan. Thanks to the hospitality of Punong Barangay Michelle Gador, who accompanied us to the factory. The factory of D' Sisters Chicharon is owned by Councilor Ruben Ortiz of Bolinawan. 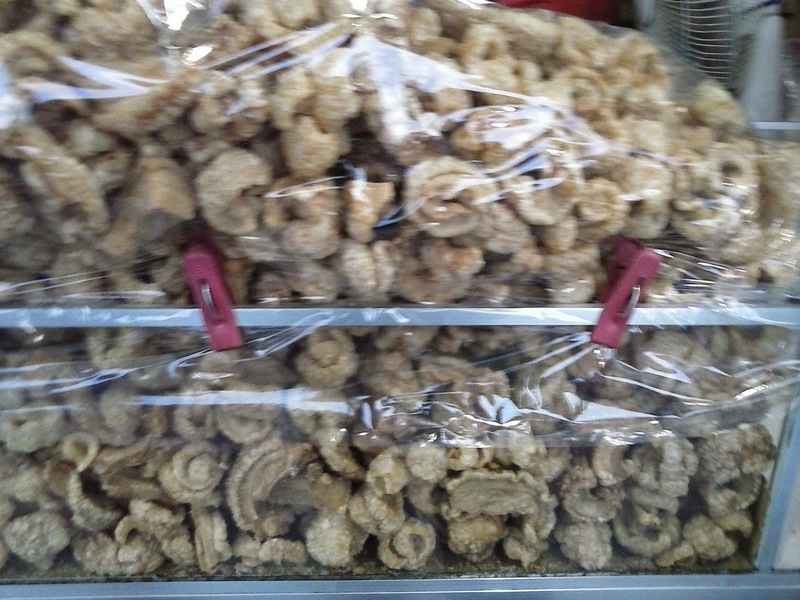 They produce chicharon for local market and send chicharon orders to other parts of Visayas and Mindanao including Iloilo, Tacloban, Davao and Zamboanga. For orders, please contact 0928-481-8498 and (032) 487-2017. What is every interesting in Carcar is that its chicharon industry is dependent on imported pork skin. We have identified seven suppliers of pork skin to Carcar and all of these suppliers have offices and storage facilities in Mandaue City. We visited a storage house in Mandaue City and found out that these suppliers are importers of meat products and supply the same to Visayas and Mindanao area. In every rural barangay in Carcar City, I saw hog raising and back yard raising almost everywhere. However, the harvests from these backyard hog raising are not for chicharon purposes but for local consumption. Carcar City Public Market caters to residents of Barili, Sibonga and San Fernando as well, neighboring towns of Carcar. We also discovered a huge commercial pig farm in Carcar, BEFCO, but these farm is supplying for local consumption of pork, not for purposes of chicharon. So amazing that Carcar has established a brand name for chicharon however its local hog industry is not supplying anymore for this raw material. In fact, I don't know if the local government knows that two years ago, chicharon industry in Carcar, already became a billion peso industry. In fact, for one supplier of imported pork skin, it is able to deliver about 100 metric tons of pork skin to Carcar City to about more than 80 chicaron makers - factory and household. I could say that for every chicharon that I would eat in Carcar, its raw material comes from other parts of the globe. I have seen carton packs and labels of pork skin that come from France and Spain. Generally, the imported pork skin being delivered to Carcar City come from Canada, USA and Europe. Think about exporting the same chicharon to other parts of the world like Canada, USA and Europe. Then think of teaching Filipinos in those parts of the globe to make chicharon instead of importing chicharon from the Philippines. Then what about the local chicharon industry in Carcar City - will it continue to depend on imported raw material? Bokarilyo. My first encounter with bokarilyo was in Carcar. It is a sweetened coconut meat. Usually light food coloring is added. When I asked one of the makers of bokarilyo, she said that the colored bokarilyo are the ones taken ahead than the uncolored bokarilyo. However, I still prefer the uncolored bokarilyo. How to obtain uncolored bokarilyo? According to my interviewee, you have to order it because it is specially made. Tapa. Seasoned meat products and famous as a part of a Filipinos breakfast, Carcar City is also home for its tasty tapa. I bought two kilograms of tapa, one kilo of pork tapa and another kilo of beef tapa. It costs to about 620 pesos per kilo. I bought it from Mat Mat, the same company that also produces chicharon. Restaurants and fastfoods. There are few fast food chains in Carcar. The nearest to my hotel was Jollibee. There are also two Gaisano malls, where Mang Inasal and other food stalls are located. There are carenderias and small kitchenettes as well but the nicest fine dining restaurant is Acasia Grill located in Barangay Valladolid. We ate there for several times because comparing the price of food therein with Greenbelt - Makati, it's a big difference. I asked for official receipt for our lunch in Acasia Grill and the receipt says of the owner is Mrs Apura, who according to our interviews, is the mayor's wife. 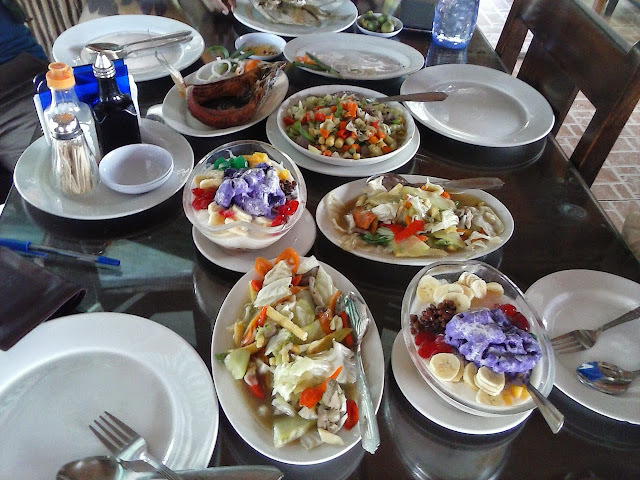 My wish when I go back to Carcar City is to have several other fine dining restaurants rather than having only one.